Earlier this week, while I was furiously clicking between my seventeen open tabs, I stumbled upon something validating and heart-warming: Invisible Illness Awareness Week. For reasons which will soon become clear, I felt compelled to share. Now, I should outline this by saying that today's blog post will be different from my others. I'm pressing hold on the pretty polaroids and jokey prose. So if you're busy or uninterested or blissful in your ignorance, now's your chance to leave. No grudges! I honestly have no idea where to start. The task of untangling my mangle of feelings and frustrations about the topic is a long and arduous one - a short blog post won't cover it. I want my blog to be uplifting. Rationally, I know that honesty makes for better relationships and better writing, but I also don't want to bore you numb. Like any other person with a head and a heart, I try to project to the world my best version possible; shockingly, illness just isn't a part of that! Just as you might not launch a first date with a minute-by-minute rundown of 'that time you had Delhi-belly', I don't feel inclined to share the intimate details of my condition with every passing stranger. I could tattoo Hemingway's famous "All you have to do is write one true sentence" on my forehead and still I'd feel the same. Talking medical: it's not hot. Escapism. It bleeds into more than enough parts of my life already. I wanted this to be a space safe from illness, free from contamination. I don't want people to think that I'm obsessed by it, or defined by it, but it is undeniably a part of my life - a non-refundable part of the package. Take it or leave it! Vulnerability. Like exposing an open wound, honesty stings. Of course, my flawless mother preaches that no one worth knowing would reject me for something so completely out of my control but - shocker! - the world is cruel. Illness comes; and some friends go. Shoutout to all of those who stay. There are worse things going on in the world. Well, yes. Of course there are. I'm not totally out of touch with reality! When I take a 20 minute nap, the world keeps spinning: I know that much. I need only read the papers, turn on the TV, or spend time in hospital next to someone fighting for breath, to realise how fortunate I am. My condition is disabling but never has my life felt in danger, and I live in a country where healthcare is free. But feeling guilty for sharing the little I do is unproductive and unhealthy and even pretty messed-up. I hide my health every day for fear that people won't believe me because they can't 'see' it. From now on, honesty is the best policy: there's no need to drag myself up the stairs when I can take the lift. A staggering 96% of disabilities are invisible. Put like this, it makes sense. Clearly, you can't 'see' a mental illness, nor can you see that someone's visually impaired (joke's on you -), or on their way to chemo, or younger than you but in desperate need of your seat. Young doesn't equate to able-bodied, and hell, 'healthy' doesn't look a certain way. I know what you're thinking - "Thank you, sweet guardian angel. 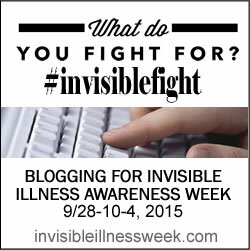 I am now AWARE of Invisible Illnesses". And I get it: the concept seems well-meaning but ultimately a-bit-pointless. The aim of Invisible Illness Awareness Week is not to sign you up to charity sky-dives, or to fling you from a bungee in Phnom Penh, and it should go without saying that no one is forcing you to host non-profit bake sales on your front drive. It's a support group for the sick; a call to arms for empathy; a plea to dig a little deeper. My Instagram feed is in no way, shape, or form an accurate representation of my life, and up until today, neither was my blog. I still squirm at my dishonesty; that I once portrayed a trip to Morocco as adventurous and action-packed when I was really in a wheelchair. But it's not just online: the moment we step out the front door, we present to the world a construction of ourselves. So when someone has the guts to knock down the scaffolding, please hold out a tarpaulin to catch the odd brick.